Gorgeous Saturday spent in the country. 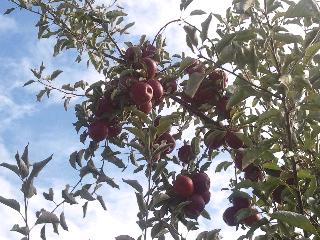 Fall surrounded us as we tramped through the orchard, collecting fruit and watching children frolic. Music up, windows down as we sped along the highways. I couldn't help but sing along. We talked of nothing and everything. Funny, a year ago I was wishing for death, looking forward to bringing myself to an end - and now this. A 180, of sorts. Happily traipsing through orchards and buying mass quantities of cheese. Eagerly looking forward to turning our fresh-picked fruit into apple crisps and pies. Life is good. Better than it has been in the last 2 or so years and I am thankful. So my cause of the month is as follows. Megs is looking for sponsors for this worthy cause! Whatever you can contribute $1, $10, whatever you can spare. I sent my $25 yesterday. If everyone contributed a small amount, it could really add up and she can reach her goal!! On Oct. 20th, 2012, she'll attempt to play an epic 24 hour video game marathon and it's her sincere hope that you'll find it in your heart to support her with a monthly pledge or one-time gift that will go directly to my hospital. This is a truly worthy cause, please help! 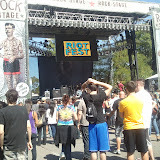 So the weekend at Riot Fest was the best weekend I've had in ages. Surrounded, enveloped, immersed in music. Amazing music. It started on Saturday with Of Mice and Men, caught a little Frank Turner, then GWAR, The Gaslight Anthem (♥♥♥♥) and ended with Dropkick Murphys and some moshing. Sunday's opener for me was Imagine Dragons, then heard a bit of Less Than Jake, saw AWOLNATION (♥♥♥OMGOMGOMGOMG YAY!! !♥♥♥), listened to Jesus and Mary Chain from a distance - same with Elvis Costello then finally finished the day with Alkaline Trio. My mementos were a pair of fuzzy dice for Mia, a kickass sparkle purse in red, a layer of park filth that I think will take a week of scrubbing to remove and some tired legs from two days of bouncing around. We has a sadistic ferris wheel operator who wouldn't let us off - I feared we'd miss Gaslight Anthem we were on the damned thing so long. We boarded the ride at the same time as two other people, yet they were let off while we went around and around and around. And around. Again. And again. To be quite honest, it was funny as hell. I had forgotten how much I love music. How important it is to me. How much meaning and influence..How much I love it live. Oh my, what a week and it's only Wednesday! This weekend holds much promise. Friday, I hope to meet this amazing artist as it's his closing. Saturday and Sunday, allll music alll day long, both days! Can't wait. I sit near a window that looks out onto a courtyard full of rain sodden plants. Leaves bowed, droplets run like liquid diamonds. It's graphite, not coal, that turns to diamonds, I think absently. I've been engrossed in a series of books for the past few days - they've been all consuming. Tales of a dystopian America. And I wonder why I'm always so taken with such novels. The ones that remind me of 451. Is it because it's where I see our society heading? Am I so cynical? My personality is always at odds, how does one be so generally happy and good natured, yet expect nothing but the worst from society, from people - all while pushing myself and others to to contribute to all that IS actually good. It makes little sense. But then, who said it had to? Consumed, like dry leaves in a fire, these novels engulf me. They're hideous, murderous things. Telling of oppression and desperation and consumption. And I cannot stop, nor do I want to. The coffee, for all my trepidation as I watched it pour into my disposable cup, isn't bad. Oddly, I'm calm. Not overly worried about her lying in surgery. Not clawing at the walls to get out. No stomach churning knots of nervousness and concern. I'm convinced she will be ok. I have no choice but to believe this - the alternative is not acceptable. The rain has stopped and a hospital employee walks with a toddler around the courtyard. The child scampers and laughs, ducking behind potted plants, easily three times her size. Her brown curls lift from her shoulders as she spins in a circle with increasing speed. Then, as if jolted by lightning, she stops abruptly. Now legs and head wobble drunkenly as she waits for the world to stop spinning, just as her body did. She laughs, uncontrollably, infectiously - her caretaker joins in. I can't actually hear their laughter but I feel it. The joy she exudes it almost tangible. There's no malice in her, no hatred, no fear to stop her. She is light and love and happiness. She embodies all that is good and amazing in this world. Maybe that's why. While I expect the worst from people, I see the potential. I see the possibilities and I cling to that - hoping against all hope that they will live up to those expectations. That their laughter will be shared and contribute to the good of our world, that they'll do the right thing when called upon. I'm no saint, but I will own up to my own shortcomings and always strive to do better. I will apologize when I am wrong, mistaken, or hurt someone. I will do what I can to learn from my past in order to do better in the future. My being dictates that I do no less, regardless of what has been done to me or those that I love. And I have hope. Hope for myself and hope for others and hope for our world.